New storage possibilities with a decorative touch. 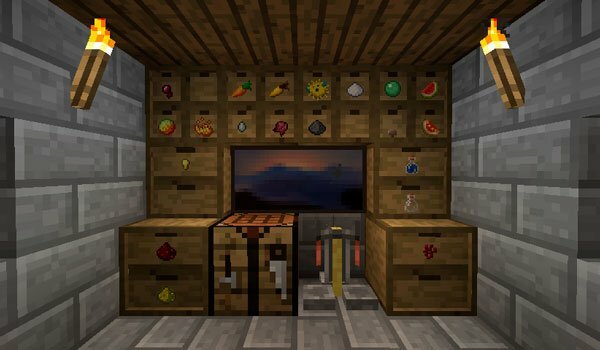 Storage Drawers 1.10 and 1.10.2 is a mod that offers new options for storing decorative objects in Minecraft. This comes to be a mix between BiblioCraft and Barrels. Ie offers the ability to save lots of items in one place, but with appearance of furniture or drawers. This mod offering 4 styles of drawers, each with varying capacity, which in turn has an aspect visually depending of the greater or lesser depth of the drawer, and of varying height. Also on the front of the drawer you see the content, facilitating life when searching for something. How to install Storage Drawers Mod for Minecraft 1.10 and 1.10.2? Paste the “Chameleon” downloaded file insto .minecraft / mods folder. Drawers Storage & decorate your home!